Here’s a last minute suggestion for a stocking filler for motorsports enthusiasts as Christmas 2018 looms large. 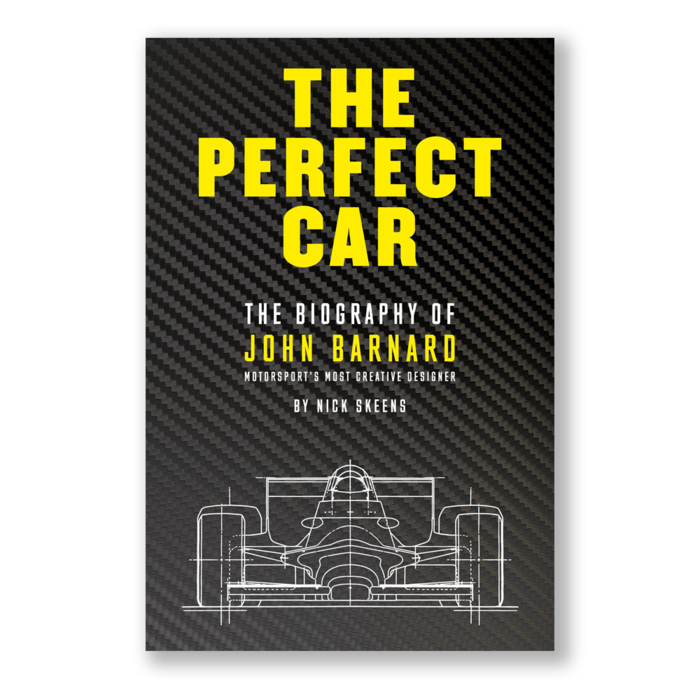 THE PERFECT CAR THE BIOGRAPHY OF JOHN BARNARD by Nick Skeen is a wart’s and all account of the life of one of the most innovative Formula One design engineers in the sport’s history. With co-operation from Barnard himself and with input from his peers and former Formula One drivers, Skeen provides a fascinating insight into the life of a man driven in his search for perfection. Born an only child into a working-class family that prided itself on being self-reliant, and with both a mother and father proficient in all things technical, it created an environment that nurtured Barnard’s tendencies to be an independent thinker and helped develop his almost obsessive attention to detail. Although his education did not take him to university, the technical colleges gave him a good grounding in the use of different materials and sound engineering formulae that eventually led to a job at Lola cars where he cut his teeth working for Eric Broadley and given a chance to complete his first racing car design. The successful Lola T250 Super Vee. Some time spent across “the pond” in the U.S. saw Barnard continue to grow as a designer, culminating with the first ground-effect Indycar, the Chaparral 2K. But the road to Barnard’s future successes was not an easy one for the headstrong designer. In the competitive cauldron that is Formula One, Barnard’s approach of taking time to develop a car put him at odds with teams he worked for such as Ferrari, and also the politics that swirled around those involved, which on many occasions saw him move on before his brilliant designs achieved their full potential. The list of Barnard’s innovations is long, and many are taken for granted in Formula One today, such as the carbon fibre monocoque chassis, the paddle shift semi-automatic gearbox, the steering wheel instrument panel to name just a few. But, more importantly, Barnard’s success forced his competitors to embrace aerospace technology and to question processes they had been reluctant to change. And unusually for a biography, there is also a “happy ending” to Skeen’s book. After decades of animosity between Barnard and Ron Dennis, who together made the Mclaren International Formula One team a winning force during the mid-1980s, are brought together again by Skeen in a fascinating final chapter. Words © Geoff Dawes 2018. This entry was posted in Books and tagged carbon Fibre, Chaparral 2K, Eric Broadley, John Barnard, Lola Cars, Lola T250 Super Vee, Mclaren International Formula One Team, Nick Skeen, Paddle Shift Semi-Automatic Gearbox, Ron Dennis on 18/12/2018 by Geoff Dawes.